TR Solids Control will comprehensively promote the enterprise brand. To raise the technical level and improve product service, to supply first-class product and service for clients. From product manufacturing to brand creation, ready to mold TR Solids Control into world-famous brand. TR Solids Control always dedicated to provide superior drilling mud recovery system, drilling equipment & accessories for customers since it’s foundation. Our products have been exported to over 60 countries and regions. Cooperative partners have reached throughout South America, Australia, Latin America, Middle East, Southeast Asia and Central Asia. TR Solids Control have a galaxy of talents and has a high reputation in the field of gas & oil drilling. At present, TR has possessed international advanced technique for the fifth generation drilling shale shaker--dual track shale shaker(linear + elliptical) and the forth balanced elliptical shale shaker. We have first-class talents and offer drilling equipment quality beyond any of your expectation and a all-round service. Brand is comprehensive embodiment for enterprise technical,products & service. Now TR has multiple agents in Pakistan, Egypt,Nigeria and other countries. 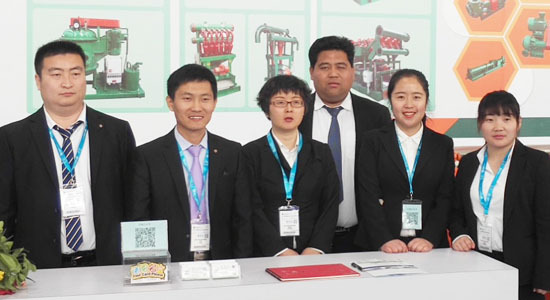 TR has been participated in several global petroleum equipment professional exhibition for many year. 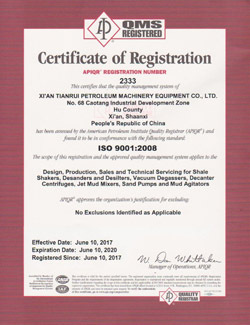 TR Solids Control acquired import and export right in 2011 and passed ISO9001 certification in 2012. We passed API certification in 2013. 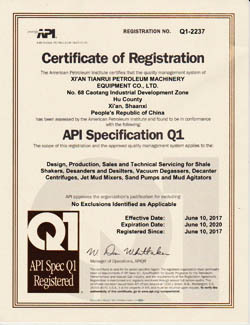 TR obtained Title for Grade AA enterprise in Shaanxi Province. TR won the honor of”Contract Credit Unit”. We gained “Chinese petroleum network supplier qualification”in 2015. TR passed ISO9001 certification,OHSAS18000 & ISO14001 certification. TR Solids Control has always been its core business in the oil&gas drilling slurry purifying and recovery system, HDD slurry recovery system, coal-bed drilling slurry recovery system and TBM slurry purifying, pipe-jacking slurry rescovery system,drilling mud pump accessories(piston & cylinder liner),drilling tool. TR provide one-stop service to glabal driling contractors and trade buyer. We are aware of fierce competetion in the market, It is our eternal pursuit to take every customer seriously, provide every customers with superior product, supply perfect service, develop with customers.